When public figures die, I sometimes undertake research on their ancestry as a kind of summing up. In the days since the death of comic and acting icon Robin Williams, for example, I have been thinking about his potential connection to three American presidents. From most online biographies, one learns that Robin McLaurin Williams’s mother, Laurie McLaurin (Smith) Williams, a native of Jackson, Mississippi, was the great-granddaughter of Mississippi senator and governor Anselm J. McLaurin (1848–1909). However, while most online trees indicated Laurie was the daughter of Laura McLaurin Berry (daughter of Stella Mae McLaurin, daughter of Governor McLaurin), there is disagreement about Laurie’s father, with some identifying him as Robert Forest Smith and others as Robert Armistead Janin. The obituary of Robin’s mother, there called Laurie McLaurin Janin Williams, identifies her as the daughter of Robert Armistead Janin and Laura McLaurin Berry Janin Smith. The 1930 census shows Robin’s mother, “Laura Smith,” age 7, born in Mississippi, with her father Robert F. Smith, age 41, married at age 33, and her mother Laura Smith, age 26, married at age 18, all living in New Orleans. Mississippi Marriages, 1776-1935, on Ancestry.com, shows the marriage of Robert F. Smith and Lana [Laura] M. Berry, on 18 May 1929 in Walthall County. One online tree indicates Laura Berry married Robert Janin in New Orleans on 6 December 1921 and then married Robert Smith on 2 September 1929 in Jackson, and that Robert Smith adopted his step-daughter. While I could not locate these records online, the data is consistent with Mrs. Williams’s obituary and census information. Robert Janin is living with his cousin in 1930 (listed as single), although in the 1940 census he is listed as divorced and living in New Orleans. The Armisteads are a very early Virginia family, going back to Anthony Armistead and Frances Thompson of Kirkdeighton, Yorkshire, who married in 1608. Their son William Armistead was baptized at All Saints’ Church in Kirkdeighton 3 August 1610, married Ann Ellis in 1632, and by 1635 was living in Elizabeth City County, Virginia. The 1910 Armistead genealogy takes Robin’s Armistead line down to his great-great-great-grandfather, “Robert [Curle] Armistead, married ______, of New Orleans.” (p. 225). A descendant of Robert’s daughter Kate, who married Leon Fergus Janin [Robin’s great-great-grandparents], appears in volume 26 of the Lineage Book for Daughters of American Colonists, as cited in an Armistead Genealogy Forum post by Douglas Brewster. The marriage of their son Herbert Lawrence Janin to Julia Louise Fassman appears in the New Orleans Times-Picayune on 7 February 1892, and the celebration of their son [Robin’s grandfather] Robert’s fourth birthday is reported in Biloxi Daily Herald on 28 September 1905. William Armistead is also an ancestor of the Harrison presidents and President John Tyler. My preliminary chart outlines the kinship between Robin Williams and the three American presidents. 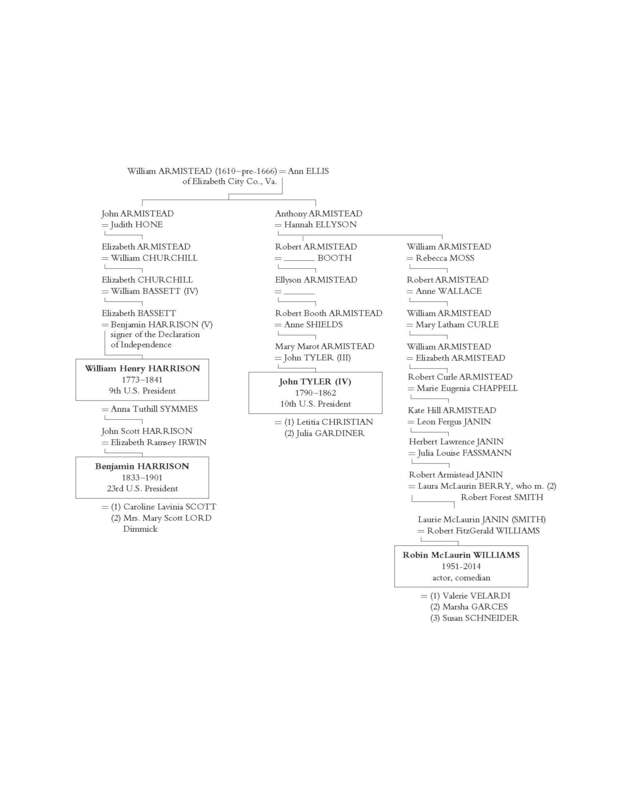 The ancestors of Robert Curle Armistead’s mother, Elizabeth (Armistead) Armistead, likely go back to William Armistead as well (perhaps twice), but are not included in this chart. Additional documentation on this line would be welcome. The Armistead chart outlining the Harrison/Tyler kinship appears on page 471 in Gary Boyd Roberts, Ancestors of American Presidents, and a recent article in American Ancestors Journal identified the maiden name of Judith (Hone) Armistead. Thank you Christopher for carrying on the great WARGs tradition. So, Southern all the way through, eh? Did you look on the Williams side? I was wondering if he was related to the Williams family in early Deerfield, MA. Deborah – His Williams ancestors appear to be from the South, his father was born in Indiana, his father Kentucky, his father Tennessee, his father North Carolina, and his father Virginia (in the 18th century). Mary Williams, daughter of William Williams from Edgecombe, North Carolina married Joseph Dillard. I’m wondering where the German ancestry comes in … ? I have students working on German-American bio projects and his name comes, obviously he’s a popular choice, but students are having difficulty finding facts on RW’s German heritage – please advise if possible. Danke schön! The German most likely comes through the Fassmann/Fassman name. Julia Louise Fassmann is his great-grandmother. The family is from the New Orleans area. Her father is Edward Victor, or sometimes shown as Victor Edward Fassmann or Fassman. This seems to be a German name from ancestral searches. I cannot find the name of Edward’s (born 1835 Louisiana) father, but I believe it might be Henry Fassman/Fassmann who married Eliza Ann Choate. When I was looking at early Louisiana censuses, I found an H. Fassman. I have also seen a name of Eliza Fassman, who was born around the same time as Edward in Louisiana, could possibly be a sister. Interessant! Thanks so much – I will share (if I may) with my students who are interested in learning more about him. Vielen Dank! Robert – For the most part, the one possibility of northeastern ancestors is Mary Eugenia Chappell (wife of Robert Curle Armistead shown on the chart). She was born in New York City in 1821 and died in New Orleans in 1888. The 1880 census indicates her father was born in England and mother was born in New York, have not yet determined the names of her parents. The RECORD DB here gives about 100 hits for “Chappell” but no main article; just marrying-in names, and no Mary Eugenia. If an Armistead marries a NYC girl, suggests it is as much as for her mother’s social status as for her father’s money. If so, then likely Dutch family ties. Ask Henry H? Kimball G. Everingham’s Gen DB at Roots Web has very specific dates for Marie Eugenia: “Birth: 21 SEP 1821 in New York City, New York. Death: 08 OCT 1868 in New Orleans, Orleans Parish, Louisiana.” But these are not sourced on her page nor on Robert’s. Obvious typo in Everingham’s DB but why use maiden name in Death record & not married name, even if widowed 21 years? Also, I can NOT find this couple together or individually in either the 1850 or 1860 censuses on Ancestry. Even tried Armstead. Nothing. So interesting, Chris. My Williamses are Welsh, so no apparent connection. Great post Chris – I will admit that I too I had wondered about Mr. William’s New England ancestry. I guess I was surprised to see that he didn’t have more – and that indeed it was as “southern” as it is. – It’s interesting, or even serendipitous, that Mr. Williams was such great friends with Christopher Reeve a man of such great N.E. lines. I appreciate you putting Robin’s lines together. Its an extremely nice tribute to the wonderful and shining light that he was in all of our lives. Good job, Chris! Thank you very much. 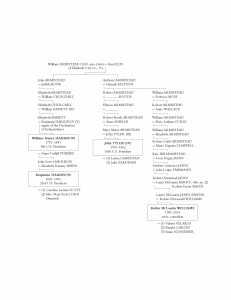 I’m the person who writes up a lot of genealogy over at ethnicelebs, and this helped me confirm what I suspected and had put up on Williams’ page a few days ago (the Janin relation). I’ll also add this page as a good reference. (What I meant was, I added your article as a reference on that page). The likely false (recent) genealogical connection between Lauren Bacall and Shimon Peres is also an interesting story. Robin Williams is also a descendant of Mary Boleyn, the sister of Queen Anne Boleyn, via the McLaurin line. Do you have more information on the McLaurin line? I’m distantly related to the Confederate General Mosby through his Virginia McLaurine great-grand parent. Could you summarize the lines here, a la GBR’s Nexus style, as it seems “godlike” is acting “goddish” by banning my ISP in no uncertain terms, and I really really really don’t want to join the site. Thanks! I recently ( with Chris’s help!) found out that I have a strong connection to the Wests of Virginia also…if it isn’t a lot of trouble, could you let me know Mr. Williams’ connection? Much appreciated! “The Gray Ghost” was a Lieutenant Colonel, not a General. Anybody remember Leslie Neilson as the Gray Ghost on Disney?